During a Level 1, 10-day workshop, you'll deepen your connection to your creative spirit while learning the fine art of AirCrete Architecture. Have the time of your life with new friends from around the world! 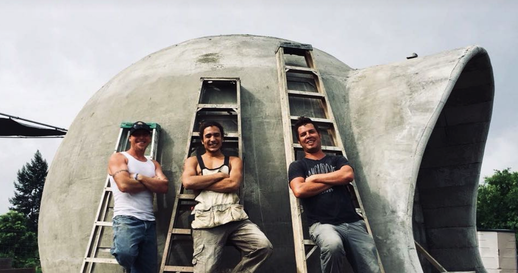 Our workshops are an amazing opportunity to learn how to build your own structurally reinforced AirCrete dome home with your own hands from scratch! Learn more about AirCrete here! DomeGaia workshops usually include time for yoga, guided meditations, dance, music, and exploring local attractions! Make new friends from around the world, learning, laughing and building together. These drawings include 12 pages detailing the layout and measurements, including floor plan, perspective, elevation and section drawings ​with all the basic dimensions. Information about foundation, plumbing and electrical details are also shown. We believe that everyone has a basic right to create quality housing for themselves. We're dedicated to help you do that! Once you feel the harmonic geometry inside a DomeGaia dome, you'll know you've come home. If you've ever dreamed of building your own home, mortgage-free, then this workshop is for you. Join us and learn how to build a dome home like the one Hajjar and Steve Areen built in Thailand! Sign up for our newsletter to be the first to hear about upcoming workshops!